What is the Mobicip app? What features does Mobicip have? How do I install Mobicip? Is it legal to use Mobicip? Modern kids spend almost all their time online. If you have a kid, you know this stuff very well. The presence of explicit, violent and disturbing content poses a serious threat for kids, and the duty of every parent is to minimize the risks of unwanted exposure. It is where parental controls come in handy. Here we will talk about Mobicip, one of those services that aimed at keeping kids safe. Mobicip is a parental control app which is aimed at keeping kids safe on their devices. It was named after CIPA (Children’s Internet Protection Act), the regulation by the US government that mandates secure Internet access for kids in schools or libraries. The app allows to restrict screen time, limit Internet and app access and filter web content. Standard: $49.99/ year. Can protect 5 devices. Enterprise: Can protect 20+ devices. The price is available upon request. Thirdly, customize your settings and start monitoring. Screen time – This feature helps you to set limits for your kid to balance their screen time and manage bedtimes. As soon as the time limit is reached, your kids will no longer access apps, games or surf the Net. Websites – This feature helps you to choose what websites your kids are allowed to access. It can help you to protect your kid from age-inappropriate and violent content by keeping a watchful eye on their browsing history. Apps & Games – This feature helps you to disable distracting apps and games on your kid device to promote healthy habits and improve their academic results. Location – This feature helps you to view the location of your target device at any time and any place. It keeps you in the know your beloved one is where they supposed to be. Videos – This feature helps you to manage the access to videos your kid watches through the popular streaming services and set age-appropriate filtering. Internet Filtering – This feature helps you to filter Internet access according to specific categories (Ads and Marketing, Alcohol and Addiction, Animals and Pets, Literature, Education, etc.). Browsing History – This feature allows you to check your kid’s browsing history including URLs and set daily or weekly reports. 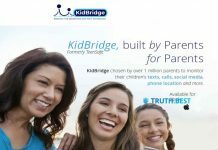 Co-parent – This feature allows another parent to keep tabs on kid’s device activities and correct their digital habits if needed. Once it is done, you will be able to supervise your kids’ devices and keep them safe remotely. The Mobicip parental control app is absolutely legal to use as it works in accordance with CIPA Children’s Internet Protection Act. Mobicip is a nice app for those parents who want to ensure their kids use their devices wisely and want to minimize the risks of online dangers. The only drawback the Mobicip app has is the absence of social media monitoring. But it definitely worth a try.